I used to buy Claim Jumper chicken meat pies all the time. Then all of a sudden I couldn’t find them any more. I wasn’t too fond of the TV dinners, but I did eat them. Why did the chicken pies all of a sudden just stop being sold. The pie crust was flakey, and there was a lot of chicken meat. Claim Jumper pies, are a lot better tasting than Marie Callender, and Stouffer’s products. I’ve been looking for the dinners also. Albertsons used to sell them but not any longer. As suggestions on where to look for them? I love claim jumpers frozen pies except for the pumpkin pie.It was so dense and tastless.I ate 1 slice of it and the rest went in the garbage.What a shame,since the rest were so good. I wasted my money. Claim Jumpers are the best Pot Pies and hard to find anywhere. 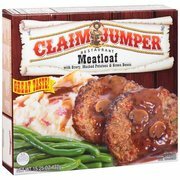 Love claim jumpers frozen dinners. Miss them so much. Hope they bring them back,just the same as they were.